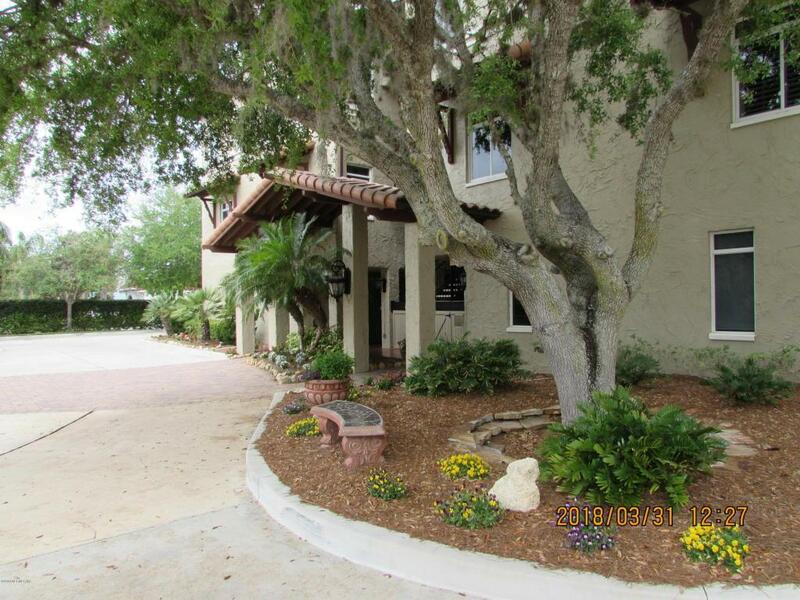 Beautiful luxury condo located in a 39 unit, gated Mediterranean-inspired Community on 4.5-acre park-like grounds. This 2nd floor corner unit sits directly on the main canal maximizing water-views and privacy. Each of the three bedroom suites has a private bath, WIC & wood floors, incl a 300 sq ft MBR Suite with Bath (double sinks,large garden tub,large walk-in shower,huge WIC). Tiled Grand Salon layout combines LR, DR & Kitchen into one entertaining space, all with direct views of the canal/boats/pool w/double sliders to the covered veranda. Kitchen has 42'' custom wood cabinets, granite, breakfast bar, SS Appliances & pantry. LR, DR & MBR have faux tray ceilings w/medallions & fixtures. Plantation blinds on all windows, oversized 1-car garage, granite in bathrooms & laundry.Community docks & lighted canal promenade accentuate the main canal. 10' ceilings w/double crown molding. 36" doors & elevator are wheelchair accessible.